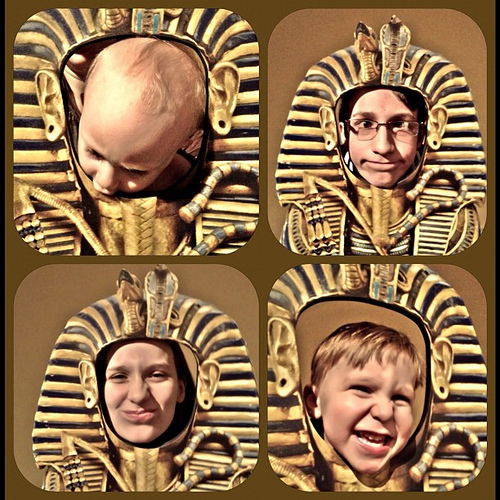 Back in December I took my kids to see the King Tut exhibit in Houston at the Museum of Fine Arts. 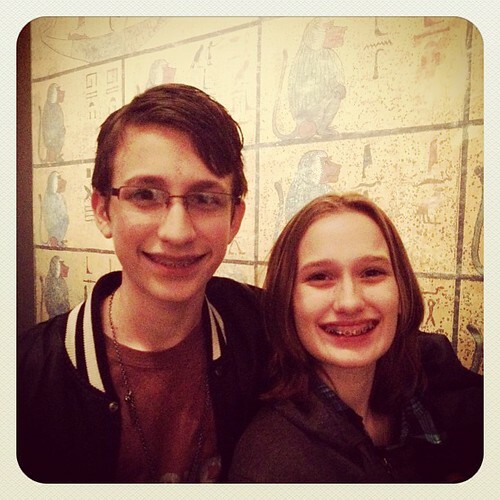 It was educational, it fit the homeschool history time-period we’ve been stuck in like mummies for what seems like eternity, AND I happen to be a history and museum LOVER. OK, I’ll admit; it was more of a birthday treat for mama than a field trip for the kids (I could linger on every tiny artifact name plate in awe). It wasn’t cheap (but thankfully included a day pass to the entire museum as well as the exhibit), so we took the family – most of which are also homeschoolers. Our little group planned ahead by calling the museum and booking the tickets (on one credit card) in advance. The only thing extra that I paid for was the self-guided audio wand (because I’m geeky like that). My elder son and I shared it. The rest of the group was content to just gaze at the golden objects and move along through the crowd. The babies were totally not diggin’ King Tut. They really cramp my museum style, y’all. I can’t wait until they grow out of this stage… oh, wait… I don’t want to rush those rubber band wrists and pudgy pinchable thighs. Nor do I want to rush the hugs and kisses stage. Forget I said that. I guess King Tut will have to wait another few years for us to come back and spend an honorable amount of time learning about him and his deceased relatives and such. I’m sure they won’t mind. 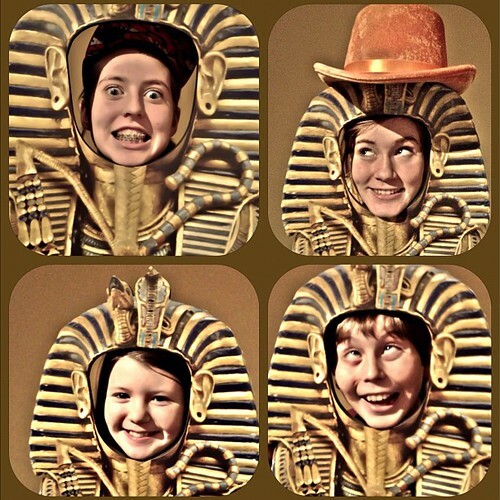 My big kids, on the other hand, are pretty much finished with Egypt now that this field trip has come and gone. My hopes of getting crafty were dashed when they banned me from making them watch any more Netflix movies about Ancient Egypt. Aside from an actual visit to Egypt, I doubt they are going to get excited about Egypt ever. again. However, they know more about it than most kids because of their “Egyptmania Mama”. It is for teen/adult readers that are in to Egyptology, archaeology and ancient history. We’ve learned so much from this amazing book about the entire history of archaeological finds. I suggest you read it before you go to the museum to get more out of the experience. You’ll read about all the people who made the discoveries of the artifacts displayed in the King Tut exhibit – information that won’t be in any textbook! (Story of the Ancient World has a corrected timeline of Egyptian Kings and an enthralling introduction by Christine Miller – whom I adore!). Since we’re in 9th with my oldest this year, I doubt we’ll come back and cover all of this again except for review… so I’m digging pretty deep with them. We do a lot of reading from the book lists suggested in my spines, so it has been taking extra long to finish our unit. Not to mention there were time periods after the baby was born when we went on unschooling tangents and picked up different time periods with delight-based learning (they read and researched on their own for a while – mostly with modern history like WWII). Now that we are back on the mama’s lesson-plan-saddle and making headway, the kids are excited to be finishing Egypt soon. 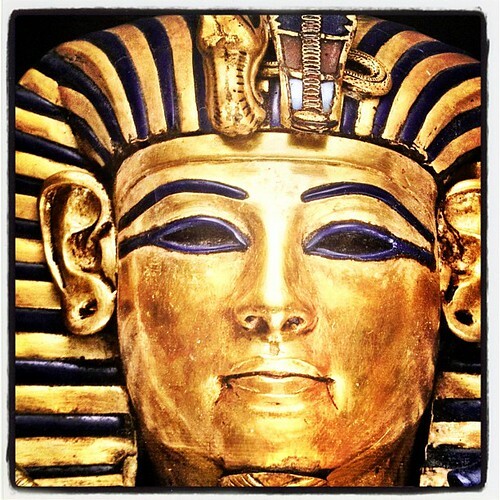 The last time I got to see King Tut, I was just a little girl – about five. 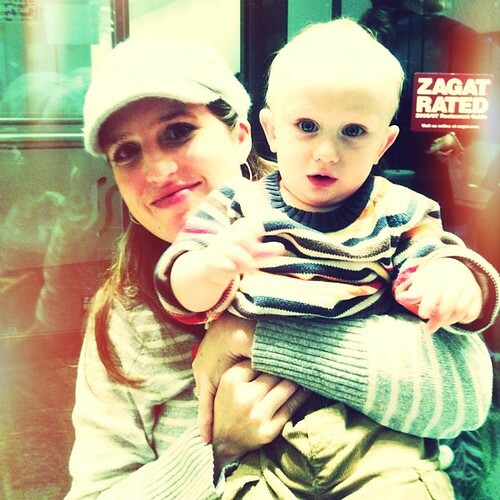 I saw him in Seattle with my grandparents. 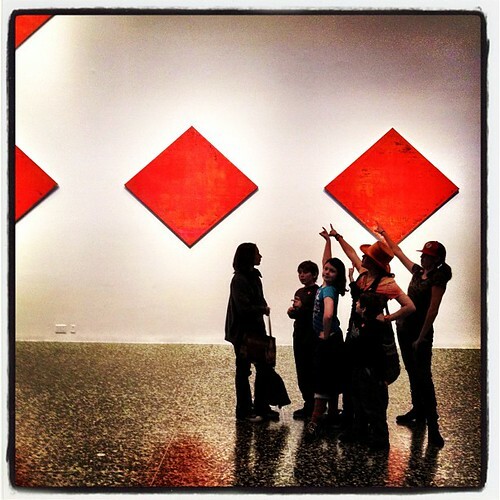 That was the day I fell in love with history and museums. Unfortunately, I had some pretty dry teachers in public school growing up and never really got interested in it again until I started teaching it to my kids as a homeschool mom. I hope when they grow up they will be passionate about learning history on their own — and continue to seek out the truths of the past. Life is one big learning experiment. A big “open book test” as one Sunday School teacher taught me. I want them to always ‘homeschool’ themselves and look at original sources to find facts – rather than take other people’s word for it. I also hope that they remember that even though mom made them read and study a lot – that she also liked to have fun. I made sure to buy them goodies in the gift store (our favorites were the deck of cards and bookmarks). Egypt-mania Link Up at the Homeschool Post – crafts, books, ideas, field trips, and more… all about Egypt! Here’s a great essay about whether Akhenaten (Tut’s dad) was converted by the Hebrews to monotheism. That kind of stuff makes me want to stay up until 2AM reading. Seriously. I have issues. But you knew that. You already read my blog. And I love you for it. The end. 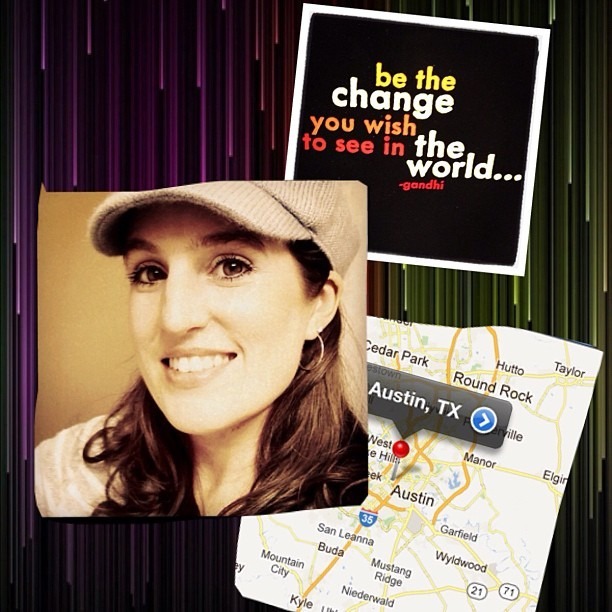 Heather…you always make me smile…and encourage me to get out more!